In the 2008 presidential election, Barack Obama won the important Latino battleground states of Nevada, New Mexico, Colorado and Florida on his way to winning 365 total electoral college votes. The 46 electors in those four key states back in 2008 were part of the coalition, but in the ended they served more to run up the score, than provide the margin of victory. In 2012, due to declining approval of Obama among Whites, and a change in the number of electoral college votes during reapportionment, Latino voters, and Latino influence states are likely to play a very crucial role in determining which candidate gets to 270 electors. The four Latino battleground states have gained 3 seats in the U.S. House, resulting in 3 additional electoral college votes - 1 in Nevada and 2 in Florida. 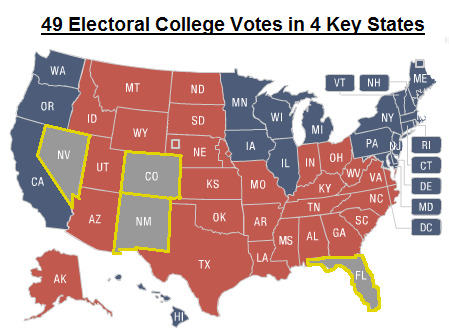 While Obama carried all four of these Latino states in 2008, the other states he won saw a loss of 9 electoral college votes in reapportionment, for a net loss of 6. Thus, the starting point for 2012 is 359 electors for Obama and 179 for the Republican candidate with states breaking as they did in 2008. However, Obama approval hovers below 50%, ranging from 46% - 54% depending on the poll. That leaves a number of states he won in 2008 as likely Republican pick-ups in 2012. The most likely pick-ups for the Republicans in 2012 are North Carolina, Virginia, Indiana, Ohio, and the 2nd House district in Nebraska -- that amounts to a total of 58 electoral college votes, dropping Obama to perhaps 301 electors, to 237 for the Republican opponent, under the new electoral vote state totals following the 2010 Census numbers. While a dozen or so states will be targeted as battlegrounds in 2012, the 49 votes up for grabs in the four key Latino influence states may be the most competitive, and the most important for Obama to secure. These four states and their 49 electoral college votes have demonstrated growth for two straight reapportionments - they had 42 combined votes in the 2000 election, grew to 46 for 2004-2008, and now hold 49 votes; growth that was largely driven by the Latino population, as Sylvia Manzano points out. Not only are they growing, but they are highly competitive. In 2010, New Mexico and Nevada elected Republican Latino governors, and Florida a Republican Latino U.S. Senator, creating some buzz that with these surrogates, Republicans may attempt to chip away at Obama's strong Latino numbers in each state in 2008. 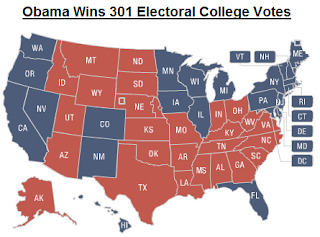 Indeed, if Obama has only 301 votes leaning towards his column in 2012 these 49 Latino-influence electoral votes are absolutely crucial - without which he'd be left with just 252 votes. Can he win Ohio in 2012? Maybe. But is he willing to risk re-election on the Buckeye state, or is there more of an opportunity for him in Latino-influence states? There are limitless possibilities of dividing up the electoral map as we look towards 2012, however it is almost impossible for Obama (as it was for Kerry) to get to 270 electors without winning a minimum of 3 out of 4 of these Latino-influence states. 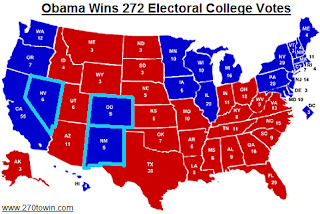 For example, if Obama loses Florida (29 votes) but wins Colorado (9), Nevada (6) and New Mexico (5) he would end up with 272 votes and be re-elected. If he fails to win New Mexico (as Kerry did in 2004), those five electors shift to the GOP side giving them 271 votes. If Obama wins New Mexico, but can't hold Nevada, those six electors would give the GOP 272 votes. Anyway you look at the map in 2012, Obama needs to hold all three of these critical Southwestern states, and the Latino vote, growing in size and influence, will certainly make the difference, just as they did in 2010.